5KVP voltage probe allows direct connection between your PowerSight meter and 5,000 Vrms. 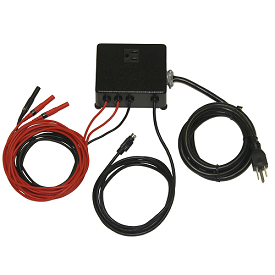 The outputs from the probe connect directly to your PowerSight analyzer, allowing complete analysis of medium voltage power up to 5KV. 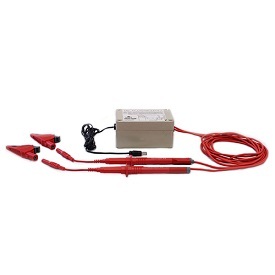 Summit Technology provides the 5KVP voltage probe to safely connect directly to voltages up to 5 kilovolts and do complete power and harmonic analysis on medium voltage loads, such as 4160V motors. 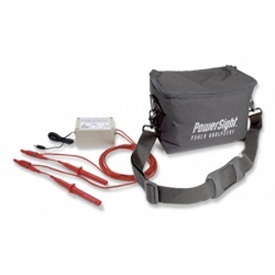 Normally, professionals who wish to measure 4,160 volt lines need to locate an installed PT (potential transformer) and then connect to the secondary of the PT. At that time, they enter the PT ratio into the PowerSight analyzer so that primary voltage values will be displayed and recorded. However, sometimes a convenient PT is not available, or the measurement must bypass the PT to verify whether the metering circuit is correct, or the frequency response of the PT is too limited to do harmonic analysis. The 5KVP provides a solution in those situations, allowing direct connection between the primary voltage and your PowerSight analyzer. Simply connect the 5KVP outputs to your PowerSight analyzer and to ground. Enter a 100:1 input ratio into your PowerSight analyzer and then hook the 5KVP probe onto the medium voltage. The connection to the medium voltage is via a shepherd’s hook that has a 1/4 inch inside diameter. 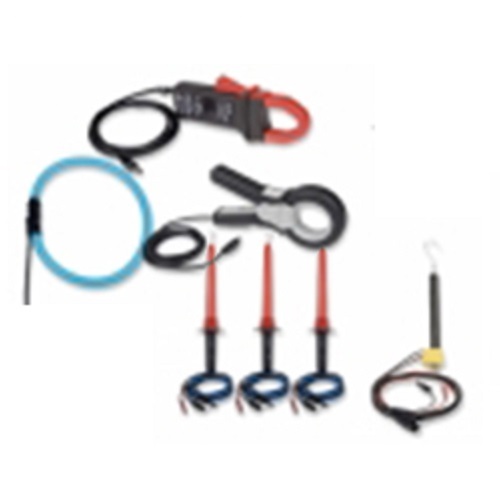 The hook attachment facilitates hands-free measurement and long-term monitoring of 5kV lines. For added security on longer studies, you can tape the hook safely onto the connection point. Each probe has a ground clamp, a neutral connector and a reduced voltage connector. The neutral and voltaage output connectors are safety banana plugs. Each lead is labeled to advise where to hook it up. 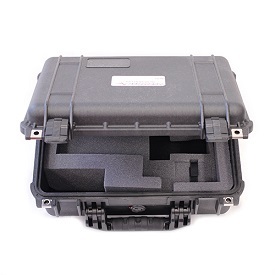 The 5KV probes may also be purchased as a set of three, including a carrying case (order 5KVPSet). Probe Dimensions: 14.75 inches long. Maximum diameter is 3 inches at the safety ring, tapering down to ½ inch outside diameter at the hook. Shepherd’s Hook Dimensions: connection hook has 1/4 inch inside diameter. Fully Extended Length: from connectors to hook, probe is 7 feet long. Weight: Probe weighs less than 1 pound. Scale: For direct reading of actual voltage, set meter for 100:1 input ratio.